From the Simplon Pass (2005m / 6578 ft) follow the waymarked path which leads to the valley of Chaltwasser and to the hut. From Unners Schallbrett follow the path which leads to Obers Schallbrett (P.1996). Continue up to P 2205 and follow the path going to Mäderlücke. Walk up the small valley of Bodmertälli and go through the Mäderlücke (2887m / 9471 ft). Go down to the lake and follow the nortnern lakeside to reach the hut. From Unners Schallbrett (1933m / 6342 ft), immediately after the refuge nr V, go up the tunnel and follow it up to the second turn, at P.1967. Leave the tunnel, go up the slope (you’ll see a few trees) and follow the brook when you can. Near P 2516, you’ll join the trail coming from the Simplon Pass. Avoid skiing over the moraine to enter the Chaltwassertälli, but climb on the right of the lateral moraine, along the brook, up to P 2787. Then turn north above the lake 2756 to reach the hut. From the Simplon Pass (2005m / 6578 ft) or from the Hospice (1997m / 6552 ft), go to the top of the skilift. Follow the irrigation canal to the east (P.2162), then cross the steep slopes of the Hübschhorn mountain, following approximately the summer path up to P.2516 (avalanche hazard in this area). Avoid skiing over the moraine to enter the Chaltwassertälli, but climb on the right of the lateral moraine, along the brook, up to P2787. Then turn north above the lake 2756 to reach the hut. It’s the highest mountain of the massif. Its summit forms the border between Switzerland and Italy. Glacial on its northern, western and southern sides, it shows 1000-meter high rock faces on its eastern side. The northern side, with its hanging glaciers looks like the big alpine faces. Although it’s close to the Simplon Pass, the Monte Leone mountain can’t be seen from the road.On this side, it’s known by skiers. 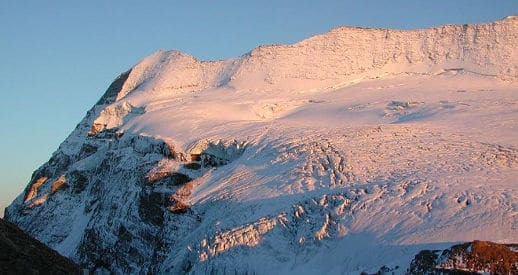 Monte Leone has no less than 5 glaciers: the Alpjergletscher, the Homattugletscher, the Chaltwassergletscher, the Gh d’Aurona and the Gh del Leone. Its isolated location makes it an extraordinary panoramic viewpoint. It’s the regular trail from the Monte Leone Hut. From the Monte Leone Hut, resume the path and go down towards the Simplon Pass to P.2516. Then climb to P.2601. Up to this point the path is still visible. Then go up to the Homattu Pass, following the slope and staying under the NE face of the Hübschhorn. Leave the Homattu Pass on your right. Walk on the Homattugletscher up to the Breithorn Pass (3355m / 11,072 ft) staying on the left side of the glacier. From the Breithorn Pass go down about 1km northeast on the Alpjergletscher. Then walk around the curm (staying at about 3200m / 10,498 ft) and reach the southern ridge (point 3320). Follow the southern ridge for about 15mn (the flagstones aren’t difficult to climb). This trail is recommended as long as the NNW side is still snow-covered. From the Monte Leone Hut, go down the path to the Chaltwasser Pass (2770m / 9,088 ft), then walk up the Chaltwassergletscher (almost flat) up to the rimaye of the ice face NNW (3289m / 10,790 ft). Get over the rimaye (often difficult), then climb the 50-55°-steep ice or snow slope to reach the WSW ridge, east of P.3403. From there, follow the end of this easy rock ridge up to the summit (3553.4m / 11,658 ft). Both trails above are possible with skis. For trail 604, you have to leave your skis at point 3320. The rest of the ridge doesn’t present any special difficulty, even if it’s snow-covered. Trail 606 is also possible. Leave the skis at the lowest point of the snow-covered slope. On foot follow the (often) icy steep slope to reach the W ridge 200m from point 3403. On the rocky ridge (first flat, then steeper), you can reach the summit II-III (rock with good holds). Warning: the ice equipment is necessary. The Breithorn consists of three peaks, but only the middle and the northern ones can be seen from the Simplon Pass. 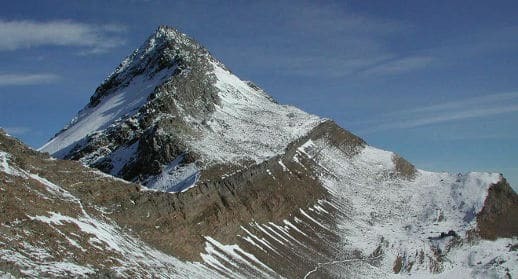 The southern peak is the actual summit of the Breithorn, raising its black horn from the Simplon road over the larch forests of Homatta. The three summits were first climbed on 9th August 1850 by Jacob Siegfried, Gottlieb Studer, Melchior Ulrich and J.Madutz as there were attempting to reach the Monte Leone. From the Monte Leone Hut, resume the path and go down towards the Simplon Pass to P.2516. Then climb to P.2601. Up to this point the path is still visible. Then go up to the Homattu Pass, following the slope and staying under the NE face of the Hübschhorn. Leave the Homattu Pass on your right. Walk on the Homattugletscher up to the Breithorn Pass (3355m / 11,072 ft) staying on the left side of the glacier. From the Breithorn Pass it’ll take you 10 minutes to reach the summit along the banks of snow. This itinerary is also an interesting ski trail. The Italian name comes from the red colour of the schists of the southern side of the mountain. A big Italian cairn with a book stands at the top. The views on the northern face of the Monte Leone are spectacular. This mountain represents another mountaineering destination from the Monte Leone Hut. From the Monte Leone Hut, you can climb the SW ridge then go down on the southern side. From the Monte Leone Hut follow the path towards Mäderlicke Pass. Next come back along a ledge way under P. 2946 m. When you reach the Passo Terrerossa (2902m / 9521 ft), then follow the ridge with fallen rocks, blocks and a few rock-climbing sections (good holds). You can get round the difficulties, if necessary, by turning right. You’ll get to the western summit first (3230m / 10,597 ft) and reach the main summit then. Way down: 40 m west of the top, follow a gully that leads you down the southern side. Then follow the path tracks across the scree of the southern side to go down to the hut. You can also take the climbing path to go down. A climbing spot is equipped 20 mn away from the Monte Leone Hut.